The STM Tech Trends 2022 were launched in Washington DC on April 26, 2018, during the STM Annual US Conference. STM thanks all contributors and especially our generous sponsor IEEE for making possible this new edition. POSTER: Download the full infographic here for printing on A3. IMAGE FILES: Available in PDF, JPEG and PNG format. POSTER IN CHINESE TRANSLATION: Can be found here. On 26 April, at the STM Annual US Conference, STM launched the newest version of its TechTrends series. Edition 2022 carries the motto: Entering the AI Era, Creative Humans & Smart Machines. The Infographic that is the result of a half day brainstorm by STM’s Future Lab Forum, depicts a segmented human brain which highlights the different impacts and opportunities that artificial intelligence has for the world of scholarly communication and STM publishing. The deeper message of the picture is that by applying artificial intelligence, humans and machines can jointly enhance many communication and information processes when collaborating in a good way. Eefke Smit, STM Director of Standards and Technology and editor of the Infographic, adds: “We placed a brain section for “Deep Publishing Knowledge’ at the centre of the brain, where in real life we have the so-called hippocampus controlling emotions and longterm memory. It reflects how in its core, scholarly communication is very much a human process, a creative craft and art in itself, making optimal use of available technology from the other brain parts, to make the academic discovery process and even research itself better. It is also the kernel from where human creativity gets infused into the other brain parts and AI-driven discovery functions”. In a world full of turmoil, struggling with fake news, non-facts and trust issues in science such as reproducibility, the centuries’ old role of publishers to select, certify and validate scientific information becomes more and more important. And technology can help. While AI can also become too powerful if self-learning algorithms are not controlled in a proper way. The part in the brain called the cerebellum, that in normal life steers the automated processes in the body (heart beat, breathing), is dedicated in this infographic to: Tech Takes Over. That risk will need control and governance to avoid smart algorithms taking over completely. Outside the brain, thought bubbles on new evolutions such as social media, open science, new metrics and blockchain pose new opportunities and new challenges for publishers. 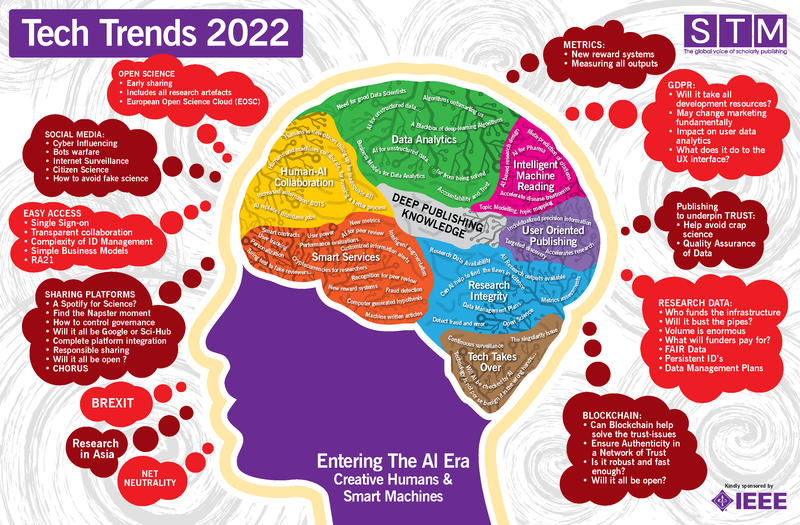 This future forecast of the Tech Trends infographic is the product of a groupwide exercise that took place on 4 December in London with 26 members of STM’s FutureLab. The brainstorm follows the Delphi-method, which is a widely used technique for technology forecasting. A printable version of STM’s Tech Trends 2022 is available on the STM website here. For previous editions of STM’s Tech Trends, please click here.